From the Magic Collection. 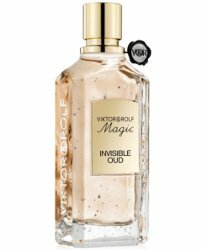 Viktor&Rolf reveal the newest spell in their Magic Collection, Invisible Oud. In honor of the greatest magic power, invisibility, the fragrance magicians cast precious Oud with a White Musk veil accord, to create an unseen scent. The seventh potion of the Magic Collection opens up a new olfactory territory, a bewitching oriental scent for women and for men, cloaked in the singular allure of Oud. Enter a world of enchantment where precious fragrances come captured in vintage apothecary bottles and are inspired by magic superpowers. Additional notes include pink pepper, benzoin, vanilla and myrrh. Viktor & Rolf Magic Invisible Oud can be pre-ordered now at Saks Fifth Avenue, $190 for 75 ml Eau de Parfum. * And the preemptive winner of the 2018 Prix Eau Réalité. Nobody is going to beat "In honor of the greatest magic power, invisibility, the fragrance magicians cast precious Oud with a White Musk veil accord, to create an unseen scent." ‘Oud has jumped the shark’. Or “I Can’t Believe They Left Out The Oud”! Magical Oud does sound like something out of a fairytale: The Emperor’s Noud Clothes. ??? ?